← Patel Fights Off Robber with a Hammer ! A three-day cultural festival, expected to attract 3.5 million visitors and a host of local and international dignitaries, is due to begin in Delhi on Friday. The massive event has been organised by influential spiritual leader Sri Sri Ravi Shankar to celebrate the 35th anniversary of his Art of Living Foundation. But the decision to hold it on the floodplains of Delhi’s main river has angered environmentalists, and led to a large fine for the festival’s organisers. The BBC’s Ayeshea Perera in Delhi explains more about the festival and what the controversy is all about. What is the festival and who is organising it? The World Culture Festival is a three-day event which will take place in Delhi from 11 March. It is being organised by the Art of Living Foundation, a global organisation claiming to offer a series of self development programmes, founded by Indian spiritual leader Sri Sri Ravi Shankar. The festival, held to commemorate the 35th anniversary of the foundation, will feature music, dance and theatre performances from over 3,000 artists. Several dignitaries including Prime Minister Narendra Modi and heads of state from several countries, are expected to attend. Confirmed guests include Pakistan’s Prime Minister Yusuf Raza Gilani, President of Nepal Bidhya Devi Bhandari, President of Sri Lanka Maithripala Sirisena, US Congresswoman Nancy Pelosi and the Japanese and Norwegian culture ministers. Organisers say they want the event to bring global cultures, music and arts together, to demonstrate the “power of peace”. Events include yoga and meditation camps as well as the stage performances. How will they manage 3.5 million people? The cumulative total of 3.5 million people is expected over all three days of the festival, with numbers fluctuating through the day. 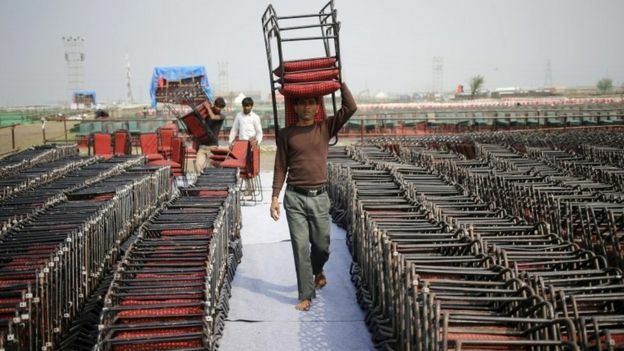 The Delhi police will help maintain law and order at the grounds, but organisers have told the BBC that they are deploying a volunteer force of close to 2,000 people who will help with crowd control and keep the venue clean. Earlier, the Delhi police expressed fears of a potential stampede at the venue, prompting India’s defence minister to deploy the army to build several temporary bridges, media reports say. There will also be 650 bio-portable toilets and 1,200 waste bins at the event venue, organisers say. 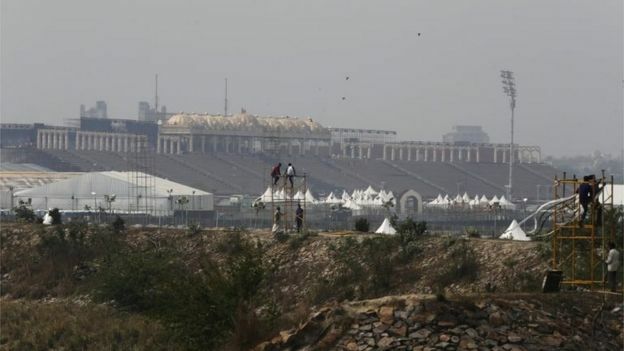 There has been concern about the environmental impact of the event, because it is being held in an ecologically sensitive area, on the floodplains of the river Yamuna. A floodplain is the area adjacent to a river, considered to be a part of the river bank. 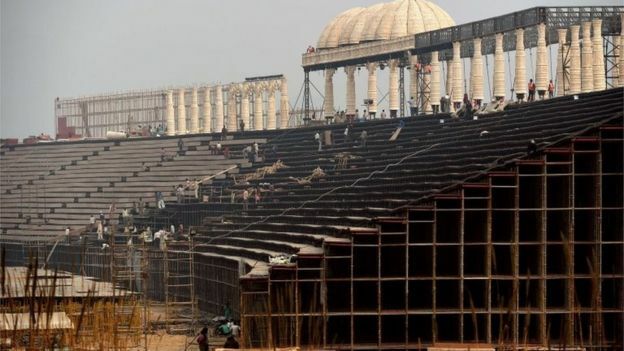 Organisers have erected a 1,200ft (365m) stage for the performances, built separate structures for visiting dignitaries, and also constructed several large bridges, all of which have required the use of heavy machinery. They have cleared all the vegetation in the area, and the ground has been filled and levelled. Environmentalists have alleged that all this construction, along with the fact that so many people are expected to attend, will cause irreversible damage to the ecology of the area. They approached India’s environmental watchdog, the National Green Tribunal (NGT), and asked it to cancel the event. One of the activists who filed the petition, told an Indian newspaper that the 1,000 acres (400 hectares) being used for the event was once marshland, and now does not even have a “single blade” of grass. What were the findings of the National Green Tribunal? 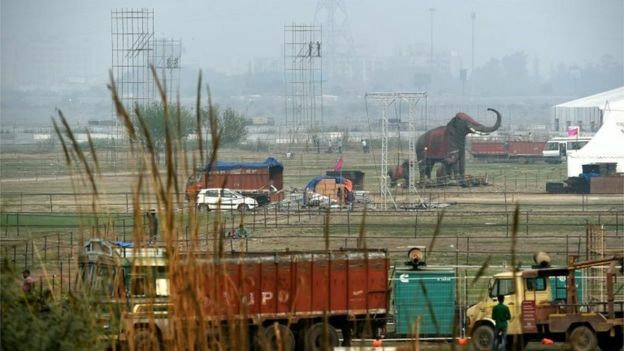 The NGT criticised the Art of Living Foundation as well as the various government departments that granted permission for the event without making the prerequisite environmental checks. A team it had earlier sent to assess the damage said the construction had most likely left a “permanent footprint” on the area. The court said all government authorities had failed in their duties in this regard and fined the Art of Living Foundation a preliminary amount of 50 million rupees ($744,262; £523,172). However it has allowed the event to go ahead. 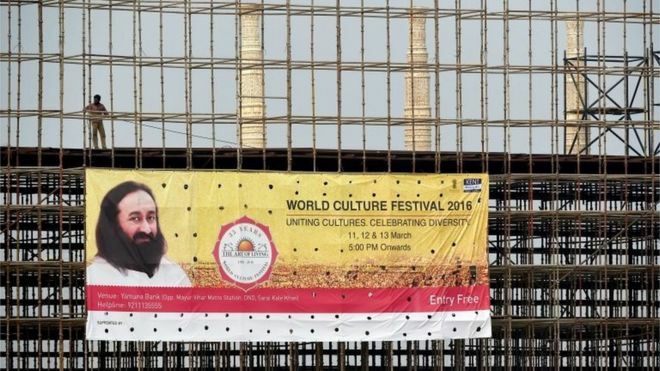 The Art of Living foundation has denied that their event has caused environmental damage. Sri Sri Ravi Shankar has told Indian media that he would rather go to jail than pay the fine. Stay tuned to see if Sri Sri Ravi Shankar is forced to jail ! This entry was posted in Delhi, India, Religions of the World, Travel, Uncategorized and tagged "power of peace", 3.5 million people expected at festival, 50 million rupee fine, Art of Living Foundation, Delhi India, India, International dignitaries, National Green Tribunal, Ravi Shankar, World Cultural Festival 2016, Yamuna River, Yamuna River floodplain. Bookmark the permalink. 2 Responses to 3.5 Million People? Well, It Is India ! wow ! 3.5 mil to attend. If I might – it would be 3.5 mil +1 –> I would like to attend as well to see the gathered 3.5 :)..Interesting stay by the environmentalists. It would be indeed be interesting to the closure. Hey Aby, This is small compared to this Shiva festival in 2013. 10 million pilgrims expected in one day ! We were in India but not there ! Thanks for the comment and stopping by. Go to India if you ever get a chance!